William George "Billy" Zane, Jr. (born February 24, 1966), mostly known as Billy Zane or Bill Zane, is an American television, voice, stage, video game, and movie actor, music executive, and movie producer. He has appeared in over 100 movies. He played Caledon N. "Cal" Hockley in the 1997 James Cameron's blockbuster movie Titanic. Zane was born on February 24, 1966 in Chicago, Illinois. He was married to Lisa Collins from 1989 until they divorced in 1995. 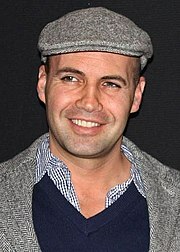 ↑ Billy Zane Biography (1966-). Filmreference.com. Retrieved on 2011-11-15. This page was last changed on 19 January 2015, at 05:36.